This white chicken chili recipe is very easy to make, but most importantly, it is delicious. I tweaked the recipe a bit in terms of how I prepare the chicken. Most recipes call for the chicken to be cooked indoors. However, I decided to smoke the chicken. I used boneless and skinless chicken thighs rather than breasts, so they only took 1 1/2 hours, and the flavor they impart on the chili is simply awesome. For those of you who have never smoked anything over charcoal, it's really easy. I use a Weber kettle grill. All you do is pile 20 to 25 charcoal briquettes on one side of the grill. Fire it up, and when it is 75% gray in color, layer on 15 pieces of hickory chips. Let them flame out and then place the chicken on the grill opposite the charcoals. Put the lid on and resist the urge to lift it. As long as you have heat coming out of the vents, you are fine. The thighs are done when they reach 170 degrees Fahrenheit. 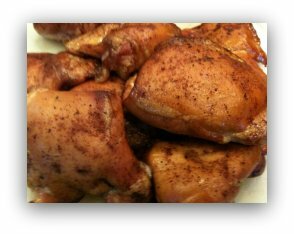 I had to show you what the smoked chicken thighs look like when they are done. 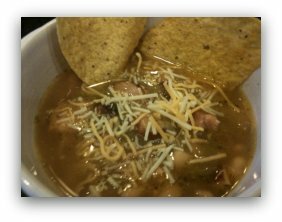 Again, you can make this white chicken chili recipe without smoking the chicken, but for something really special, give it a try. Also, many recipes call for chicken breasts, which you can certainly use. My belief is that the breasts dry out and/or become rubbery when you reheat. The chicken thigh is much moister, and in my opinion has a lot more flavor. From this point it is a combination of simply layering the flavors after you saute' the onion and garlic. Believe it or not, this chili will be even better as leftovers. Don't forget to watch the video. Please forgive me for the lack of production quality. We did this at the last minute. Saute' onion and garlic in 2 tablespoons of olive oil until translucent over medium heat. Takes 3 to 5 minutes. Add the chicken broth, beans, green chili peppers and chicken. My monthly newsletter provides you with tips, pointers and techniques that you will not find on the web page. Sign up below, and rest assured, your email address is safe with me. If you have a question for Dave about this recipe or about any other recipe or technique, Click Here. and return to BBQ My Way homepage.